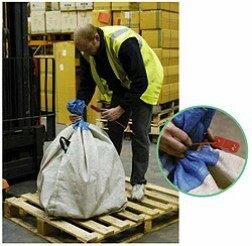 Maxi Jawlock is a polypropylene, strong & long, pull tight, security seal. It is designed for ease of use with a smooth, 4mm diameter strap and an optional side tear off panel, for quick tool free release. It is available in 3 lengths, supplied in multiples of one thousand seals, pre printed with sequential numbers and is normally available for UK delivery within 2 working days. 300mm length @ £127.00 per 1,000 excl VAT. 400mm length @ £134.00 per 1,000 excl VAT. 500mm length @ £150.00 per 1,000 excl VAT. Need a smaller version of this product ? Try Jawlock or Mini Jawlock. * Please note, these products are only available to purchase online, for UK mainland customers. If you wish to purchase from outside this area please do not hesitate to CONTACT US FOR A RAPID QUOTATION. All prices exclude carriage & VAT, added at checkout.